After Zero Month, we now return our titles to their regularly scheduled numbering. This issue does build on some of the ideas from issue zero but keeps right on from where #12 last left us. This is fine since the issues following the zero issues weren’t toted as good jumping on points. But it is the start of a new story arc, so in that, it can be argued a new reader can start here. 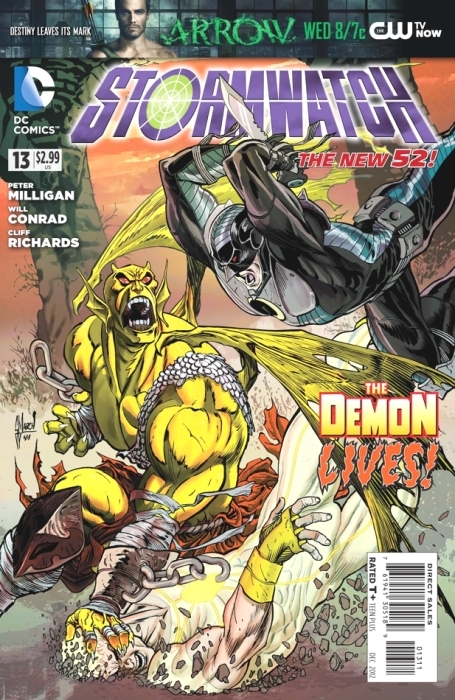 Last month’s zero issue was amazing and showed us the connection between Stormwatch and Demon Knights. 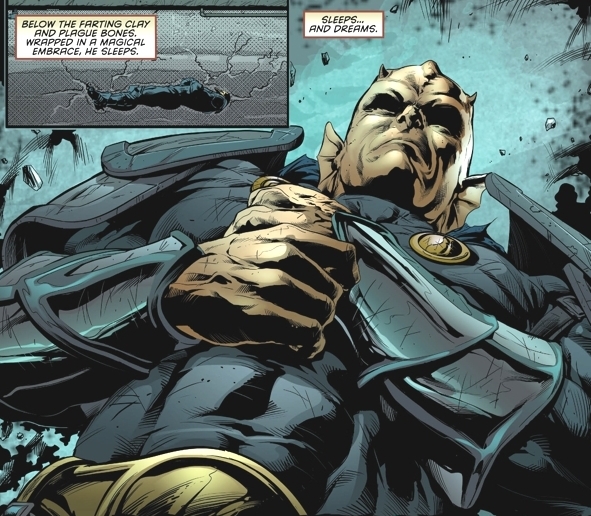 That connection continues here as Etrigan the Demon makes his first appearance in the modern DCU. I haven’t been following Demon Knights since issue #7 so I have no idea what went on with Etrigan in that title. He’s a character that I never knew much about pre-New 52. So my exposure to Demon Knights early on gave me a good idea of what to expect in this issue where he was concerned. Since this is the first part of a new arc, a new reader could start reading here and start with a fresh story. 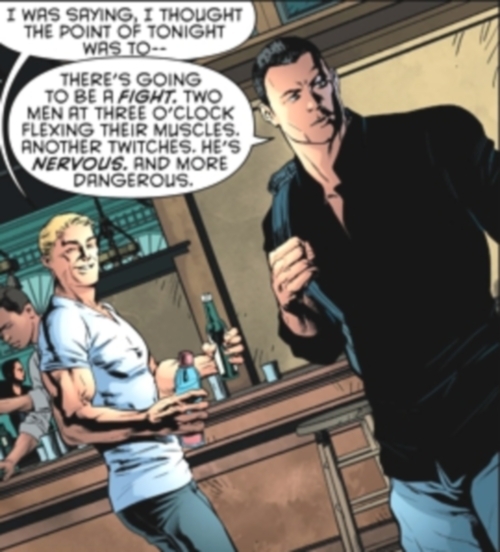 And while I think we get a good round of “introductions” to each character, it is obvious that with the exception of Apollo and Midnighter, they are all dealing with plotlines that have been laid out several issues before. So, it’s still a good idea to back track and get the early issues to really appreciate what’s going on here. I was a little thrown off by artist Will Conrad having to split the issue with Cliff Richards. But thankfully they’re styles aren’t too different so it wasn’t jarring visually. In my opinion their rendition of Etrigan is much better than Guillem March’s version on the cover. Since it is the beginning of a new story arc, all in all I think the issue was ok. It’s always hard to judge an issue when you know it’s a part one of a larger story. The first issue is usually set-up and that’s what we get here. But it is a great set-up and besides the story with Etrigan, we still have dangling plotlines involving Harry Tanner and that giant alien horn which will hopefully come to fruition soon. Even though I felt this is the weakest issue of Stormwatch that we’ve gotten in a while, I can understand why. Peter Milligan has done well to carry this title forward. We’ve gotten six really good issues from him (and that awesome Red Lanterns #10 which was basically Stormwatch #9.5). So I can’t complain too much about an issue that allows us to step back and reset for a new story. This is still my favorite book each month and I’m curious to see how the team will deal with Etrigan. 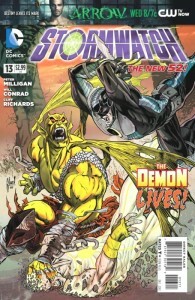 This entry was posted in DCU, Reviews, Stormwatch and tagged demon, etrigan, Peter Milligan, will conrad. Bookmark the permalink.